This summer, I am literally obsessed with cold shoulder and off the shoulder tops. I’ve always liked them but theres just something about the styles and designs this year that have really got me swooning over them. They’re fun, flirty and feminine which is exactly how I love to dress. 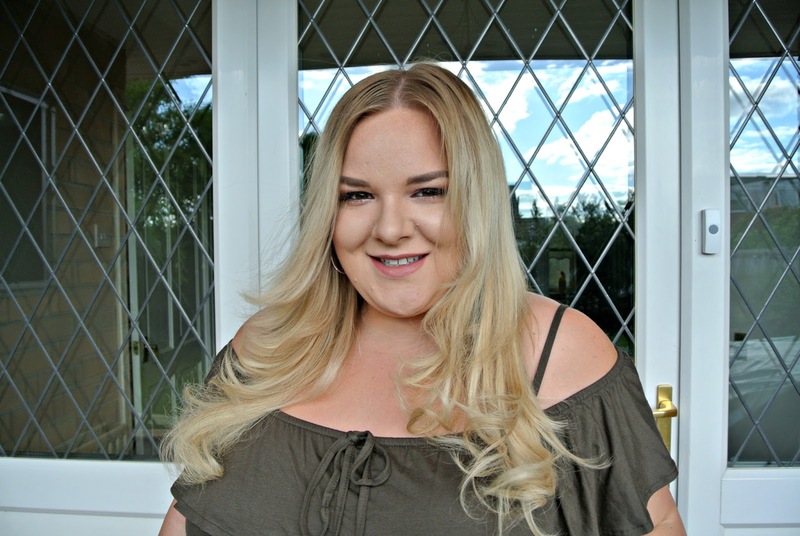 You might remember the plus size black cold shoulder top that I wore in this post, well its just gone in the sale and I’m SO tempted to buy another seen as though I’ve worn the one that I already have so frequently, but I’m being sensible! The top I’m wearing here is the Tie Front Cold Shoulder Top in khaki but annoyingly, they only have it in black on the website, from what I can find anyway. In store, its current season and is available in khaki, black and white so hopefully you’ll be able to find the other colours if you actually go into the shop. The sizing is generous, I’m wearing a 20 but I’d usually take a 22. The arm holes are a little deeper than I’d usually like as my flabby bit under my arm shows a bit but I’m not too concerned with that, as long as the side of my bra isn’t showing! I love the khaki green colour as its one that I don’t wear too often but whenever I do, I really think that it suits me. The quality of the fabric is lovely as its light weight but holds its shape really well and although it looks like its a bit sheer in some of the photos, when you look at it in real life, it isn’t at all. I’d really urge you to go check out this top as for £8 its an absolute bargain whether you’re going abroad and want to wear it with a shirt or shorts or staying at home this summer and pairing it with white jeggings or jeans like I have or printed trousers. I’ve linked plenty of options below. I’ve paired my white jeggings and khaki off the shoulder top with my Gucci wristlet and my new Hotter Breeze Wedges in the Flint colour-way that I got from at their Eldon Square, Newcastle store. I went to an event there this spring and found out all about the shoes that they make for women and men. As a company that started back in 1959 with the aim of creating shoes that feel as comfortable to wear as slippers, Hotter have certainly achieved that goal. These wedges are so incredibly comfortable to wear; I can walk and stand for hours in them without them hurting my feet and they feel as light as a feather. They’re really secure on my feet so I don’t feel as though I’m going to fall over in them which is very important for me, especially when I don’t wear heels all too often. Many of their shoes have additional features to aid their comfort, for example, hidden elastic for feet that swell and pyramid technology under the ball of the foot to cushion and soften the impact that can come with walking in heels. I like that the Hotter Breeze Wedges have different colours stripes; the taupe, white, black and orange colour way is my fave out of the different ones that they do as I can match them to so many different summer outfits. The Hotter store was fabulous as the staff were so friendly, very highly trained and very helpful, especially when it came to trying on and fastening up shoes. Attention to detail had not been spared in the design of the store; even the ample seats were at just the right height for trying on shoes and bending down to fasten them. There was so many different pairs of shoes to choose from including ones that would be suitable for holidays like flip flops and sandals, work shoes, wedges, walking shoes and trainers. I do feel as though the vast majority of the shoes are aimed at an older age group than myself, or for those who prefer a more vintage look, however there was a few pairs of wedges that I really loved the look of, all of which I’ve linked to below. This was great to see as being plus size, its hard to find shoes that don’t absolutely KILL my feet so to find some styles that were suited to me and my style was ideal and I’d definitely check out Hotter again for comfortable wedges. This is definitely one of my favourite outfits of the summer so far. I seriously need to buy more khaki pieces as its such a flattering colour, especially with a tan! That's an interesting shoulder cut, really suits you too! Beautiful color! And great shoes! I will have to give those wedges a try, as I have never been able to find a wedge that is comfortable.